A central bank will be concerned about the exchange rate for three reasons: (1) Movements in the exchange rate will affect the quantity of aggregate demand in an economy; (2) frequent substantial fluctuations in the exchange rate can disrupt international trade and cause problems in a nation’s banking system; (3) the exchange rate may contribute to an unsustainable balance of trade and large inflows of international financial capital, which can set the economy up for a deep recession if international investors decide to move their money to another country. Let’s discuss these scenarios in turn. This video reviews some of the concepts you’ve already learned about the foreign exchange market and also provides a good example of how the appreciation or depreciation of money impacts imports and exports. Exchange rates can fluctuate a great deal in the short run. From February 2008 to March 2009, the Indian rupee moved from 39 rupees/dollar ito 51 rupees/dollar, a decline of more than one-fourth in the value of the rupee on foreign exchange markets. We read earlier that even two economically developed neighboring economies like the United States and Canada can see significant movements in exchange rates over a few years. For firms that depend on export sales, or firms that rely on imported inputs to production, or even purely domestic firms that compete with firms tied into international trade—which in many countries adds up to half or more of a nation’s GDP—sharp movements in exchange rates can lead to dramatic changes in profits and losses. So, a central bank may desire to keep exchange rates from moving too much as part of providing a stable business climate, where firms can focus on productivity and innovation, not on reacting to exchange rate fluctuations. One of the most economically destructive effects of exchange rate fluctuations can happen through the banking system. Most international loans are measured in a few large currencies, like U.S. dollars, European euros, and Japanese yen. In countries that do not use these currencies, banks often borrow funds in the currencies of other countries, like U.S. dollars, but then lend in their own domestic currency. The left-hand chain of events in Figure 1 shows how this pattern of international borrowing can work. A bank in Thailand borrows one million U.S. dollars. Then the bank converts the dollars to its domestic currency—in the case of Thailand, the currency is the baht—at a rate of 40 baht/dollar. 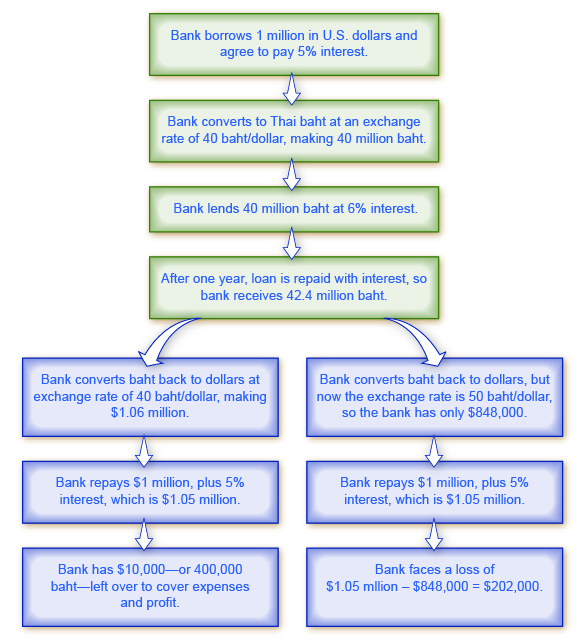 The bank then lends the baht to a firm in Thailand. The business repays the loan in baht, and the bank converts it back to U.S. dollars to pay off its original U.S. dollar loan. Figure 1. International Borrowing. The scenario of international borrowing that ends on the left is a success story, but the scenario that ends on the right shows what happens when the exchange rate weakens. In 1997–1998, countries across eastern Asia, like Thailand, Korea, Malaysia, and Indonesia, experienced a sharp depreciation of their currencies, in some cases 50% or more. These countries had been experiencing substantial inflows of foreign investment capital, with bank lending increasing by 20% to 30% per year through the mid-1990s. When their exchange rates depreciated, the banking systems in these countries became bankrupt. Argentina experienced a similar chain of events in 2002. When the Argentine peso depreciated, Argentina’s banks found themselves unable to pay back what they had borrowed in U.S. dollars. Banks play a vital role in any economy in facilitating transactions and in making loans to firms and consumers. When most of a country’s largest banks become bankrupt simultaneously, a sharp decline in aggregate demand and a deep recession results. Since the main responsibilities of a central bank are to control the money supply and to ensure that the banking system is stable, a central bank must be concerned about whether large and unexpected exchange rate depreciation will drive most of the country’s existing banks into bankruptcy.